NWT Beaded Sequin Silk Top Black Tie Oleg Cassini Wedding Bridal Gold Medium 19.5” Pit to Pit; 22” Top of Shoulder to Bottom Please refer to pictures for condition and feel free to ask any questions. Thanks for looking! Amazingly gorgeous Beaded and sequin top from Oleg Cassini! See photos for details of style. Always smoke-free. Paisley pattern. We strive for 5! Made by HE-RO Industries INC. No missing sequin!! The shoulders are shown in the last two photos. Pictures really don't do it justice! 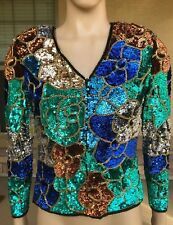 NWT VTG Beaded Sequin Silk Trophy Jacket Black Tie Oleg Cassini Tunic Geometric 17.5” Pit to Pit; 23” Top of Shoulder to Bottom Please refer to pictures for condition and feel free to ask any questions. Thanks for looking! Made by HE-RO Industries INC. No missing sequin!! The shoulders are shown in the last two photos. Pictures really don't do it justice! Fringe around the trim is in excellent condition! VINTAGE OLEG CASSINI PEARL BEAD SEQUIN SILK EVENING COCKTAIL BLOUSE TOP DRESS L. Multicoloured beaded and sequin cocktail blouse. due to the beading this is a heavier top long sheer sleeves lined bodice hidden zipper in the back in excellent vintage condition. No major damage or bead/sequin loss. There may be a random bead or sequin missing Approximate measurements flat across chest 20” length 26” Condition is Pre-owned. Shipped with USPS First Class Package. Oleg cassini made BY He-Ro industries Inc. Pure Silk with Sequin and seed beads. Floral leave design. We try our best to take pictures in various light settings if possible. I thoroughly inspect the item as well. ARMPIT TO ARMPIT: 26. LENGTH: 24. Very good condition. Length: 24" from the top of the collar to the bottom. Sleeves: 10". See photos for more details. 10% of this SALE GOES TO . 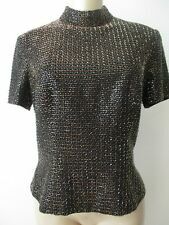 OLEG CASSINI Sequined/Beaded 3/4 Dolman Sleeve Top. Material: 100% silk. Closure: hook & eye in the back of neck. Color: black, pink. Length: 22". Condition: great, minimal signs of wear. BUST - 32". CLOSURE - BACK ZIPPER. COLOR - BLACK & BRONZE. LENGTH - 20". SIZE - S.
Shell is 100% Silk with Bright Purple Sequins. Lining is Rayon. In Gorgeous Condition. It has been in my Closet for at least 20 Years and was never worn. 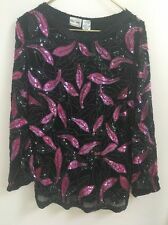 OLEG CASSINI TOP PLATINUM COLLECTION RETAIL $110.00 SIZE SMALL Sequin animal print top pull over Side slits MEASUREMENTS stretchy Bust: 34" Sleeve: 24" Length: 27" top of shoulder down New with tags Check out my other HIGH END DESIGNER ITEMS! !